"It hurts Mr. Harry!" Lauren cried as the chemotherapy was being pumped through her small body. Harry pulled her onto his lap and stroked her hair while gently bouncing her. "Shh, I know love, it&apos;s okay. I&apos;m here, it&apos;s okay. You don&apos;t have to call me Mr. Harry love, just Harry is fine." Lauren nodded and cuddled further into Harry. He rubbed her back as she slightly whimpered at the feeling of the poison flowing through her. "You alright?" "I know love. Do you feel like you&apos;re going to be sick?" Lauren thought for a moment before shaking her head no. Harry internally sighed in relief, the poor girl was going through enough, he didn&apos;t want her to have to go through that too. "Good news love, your chemo is done for the day. Now let&apos;s get these wires off of you and get you up to a room." He said as he reached for her. He was shocked when she seemed to cower away. "What&apos;s wrong?" "I can&apos;t go up to a room, mum said we can&apos;t afford it. I have to go home." "That&apos;s not safe love, plus I can&apos;t just let you leave. Don&apos;t worry about the cost of the room yeah? I&apos;ll take care of it." He explained as he held his hand out for her which she reluctantly took. He led her up to her room for the night and helped her into bed where she quickly fell asleep due to being exhausted from the chemotherapy. Harry turned off the light and kissed her forehead before leaving the room. 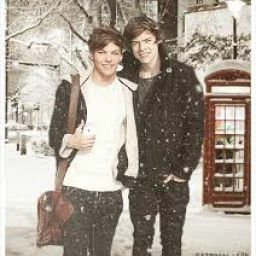 He decided to go call Louis to explain because he was expecting him home almost an hour and a half ago now. He went to the break room and grabbed his phone, seeing five missed calls from Louis, and quickly called him back. "HARRY EDWARD STYLINSON YOU BETTER HAVE A GOOD EXPLANATION FOR THIS!" "Lou, please let me explain." Louis quieted down. "This little girl walked in here alone for a chemotherapy treatment. She&apos;s five and she was scared so I told her I&apos;d stay with her. Olivia is currently doing some investigating because no five year old should be going anywhere alone." "That poor girl. Take your time and just text me when you&apos;re on your way home." "I will, how are the boys?" "Okay...there was a big communication issue earlier that resulted in a lot of tears and a timeout. Ashton forgot to sign and Niall took something that Ashton wanted so he hit him with a toy truck. Ni got a little cut above his eyebrow and the blood freaked him out so he started screaming and sobbing. He&apos;s okay now but he refuses to even look at Ashton." "Harry I found out a few things!" Olivia said as she ran into the room. "I&apos;ll be right out...hey Lou, we&apos;ll definitely discuss this more when I get home. I&apos;ll see you later love you bye." He rushed out before hanging up and following Olivia over to the computer. "What did you find?" "There&apos;s no records of her mother or father. She has no birth certificate. I&apos;m shocked at how she&apos;s been able to receive treatment or even a diagnosis. Did she tell you her last name or anything?" "No, just her first name and her age. I&apos;ll ask her a few more questions when she wakes up but she&apos;s not allowed to leave here until we have answers. Who knows what her home situation is like? Judging by what we know it doesn&apos;t look too good. I don&apos;t want to put her in any danger." "I agree, I&apos;ve already alerted our boss and he said he&apos;ll make sure she&apos;s well looked after and that they&apos;ll waive all medical fees. I&apos;ve just called child services and the police and they&apos;re on their way." Harry just nodded and texted Louis an update saying he wouldn&apos;t be home until late and to go ahead and put the boys to bed without him. Within fifteen minutes the authorities were there and were on their way to Lauren&apos;s room but Harry stopped them. "Wait, can I go in to talk to her first? I don&apos;t want her to be overwhelmed." They nodded so Harry slowly opened the door and went inside, closing the door behind him. "Lauren honey I need you to wake up." Lauren slowly opened her eyes and reached out for Harry who immediately picked her up. "There&apos;s some people here who want to ask you some questions. I want you to be honest with them, they&apos;re here to help you. Can you answer all their questions?" Lauren nodded as she laid against Harry&apos;s chest. He repositioned her on his hip and stood up to let them in. He just hoped they could get the answers they needed.